Here are my two recent acquisitions. Glad to be part of the community. 1990 EX with 136,000 miles. Automatic. 1993 SE with 302,000 miles. Automatic. Welcome! Are these the two hiptech posted about a while ago? I thought the SE only had 50,000 on it? Decided not to sell or couldn't get a reasonable price so you kept them? Beautiful examples - I'm jealous. Midwest life is taking its toll on mine. PS: Sure it's a 90? I thought all 90s had black mirrors and 91 went to painted mirrors - I suppose someone could have painted them to match or swapped from a 91. Last edited by fleetw00d; 10-10-2018 at 04:07 PM. Oh that's right, Hy posted one or both of these. He has an SE like this one as well, but with 130,000 miles on it. Yes the Mulberry Pearl car is definitely a 1990, with the original mirrors. 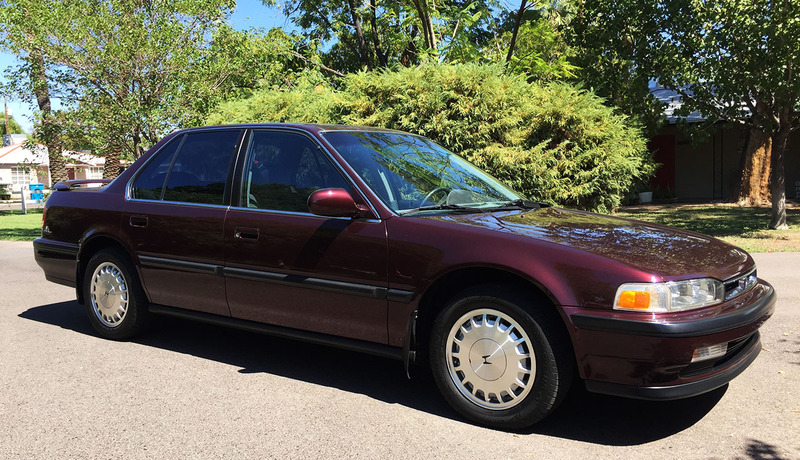 The 1990 Accord Sedan factory brochure that I have shows body color mirrors on EX trim. Haha yes, that's my 1992 NSX. I've had it about 7 years. Formula Red with Black interior, 5-speed manual, 113,000 miles. I also have 2 Integras, 2 Legends, a Vigor, and an ILX. That’s a nice collection and garage! Was wondering why that garage looked familiar....now it all makes sense. Seen a good amount of your Youtube videos. Welcome! Last edited by Corweena; 10-12-2018 at 12:14 AM. so clean!!! And sweet NSX!! Awesome awesome awesome. This guy knows how to Honda. That's dope man! How's the leather seats in the SE? All the SEs I see the leather seats are always worn. Thanks guys, yeah the 90 EX came with all kinds of protective gear. The car cover, steering wheel cover, sheepskin seat covers, dash mat, rear deck cover, even a towel over the rear seat. I've driven it maybe 500 miles since buying it and I had a full timing belt / water pump service done since it was 10 years old. 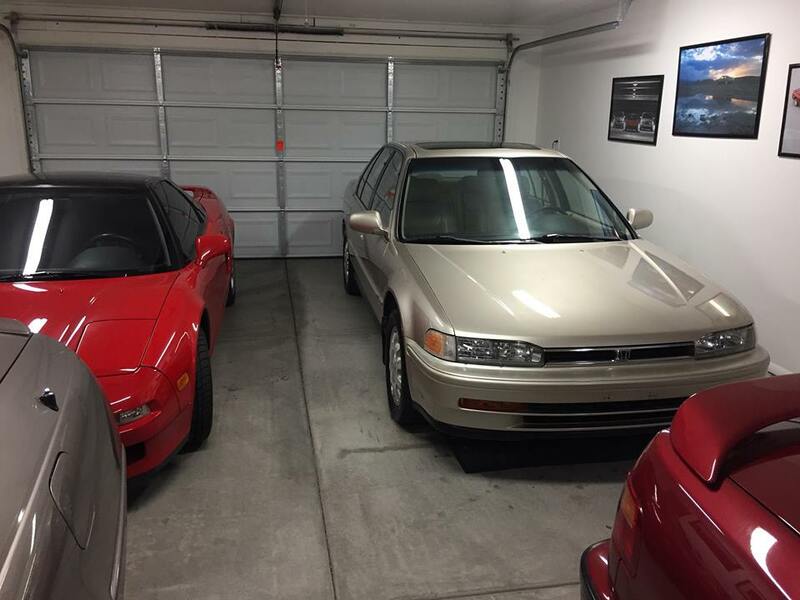 Definitely, Kai is a good buddy of mine and I helped store his 89 Accord SE-i that he had for a bit. 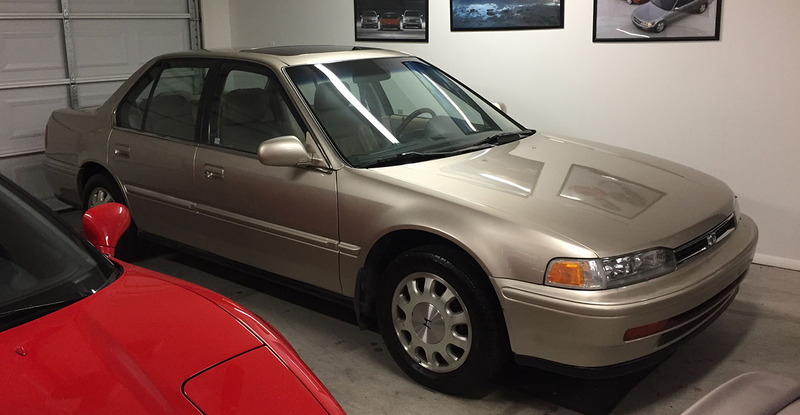 I ended up selling the cashmere 93 SE to a guy named Ivan so I'm down to just the 90 EX now.